The Broad Street Run (see pervious post) went even better than expected!!!! 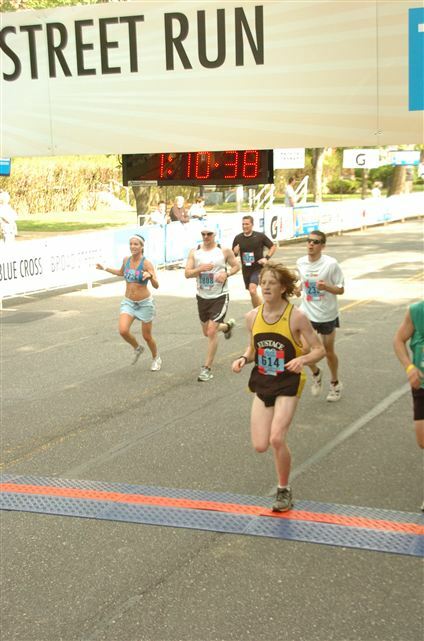 I ran the ten-mile race down Broad Street in Philly in 1:08:24, placing me in 712th place out of 25,244 finishers. I ran an average 6:50 pace for ten miles. I was beyond thrilled, and burst into tears after crossing the finish line. As I walked through the post-race area, I couldn’t help but wonder how easy it would be to break 1:05 for the race next year. In the week following the Broad Street Run, I ran the Japan Day Race for Hope in NYC and placed in the top 5 women for my age group – I was amazed! A year ago, I was nowhere near able to place in a race – and here I was with my name on the website of top finishers! Unbelievable. I haven’t had a race since May 8th, though I was hoping to participate in a couple of races since then. Photo shoots and film work has conflicted a bit. However, I’m eager to get back on the starting line! I have been running, and am focusing on clocking miles injury free (some days I push the pace, others I take it slow, some are short, other days I go long), until I begin official marathon training in July for the 2011 Philadelphia Marathon! Stay tuned, stay active, and I recommend reading Ultramarathon Man, by Dean Karnazes. I just finished it. It’s a great book for runners and non-runners alike, as anyone who has a passion or beats to their own drummer will feel inspired and view life, pain, and goals in a different way! ~ by Elizabeth on June 12, 2011.